Monday 4th April -Australian Market Wrap | Beeks Downunder-Because not all financial news is boring! 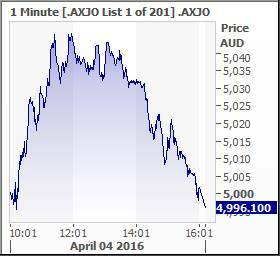 ASX200 gives up all the early gains in quiet, convictionless trading to close down a disappointing 4.1 points at 4995.3. Banks rallied but energy and materials (BHP) stocks sucked the life out of the optimism. Asian markets lower as Nikkei falls 0.48% and China closed for a holiday. 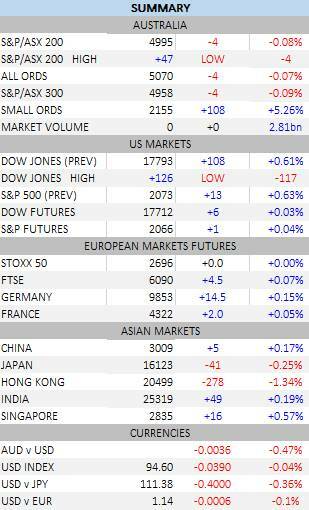 Weaker inflation numbers knocked the dollar back to 76.35 whilst US futures +6. A pretty disappointing end after a solid start to the trading week. After a cautious open, the market gathered confidence and pushed higher in thin trade to hit a high of 5046 around lunchtime before some pre-RBA nerves set in. Volume was very light as the banks managed to shrug off some media negativity (seems to be SOP these days) to post some good gains. The 11.30am data dump did little to upset the momentum but Asian market weakness did sap some of the enthusiasm in the afternoon session as the headline index slid on BHP’s sliding share price. The focus will turn now to the RBA meeting tomorrow where Glenn Stevens is expected to keep rates on hold (again) and attempt a jawbone (degree of difficulty now around 4 with pike) to get the wayward AUD back under control. 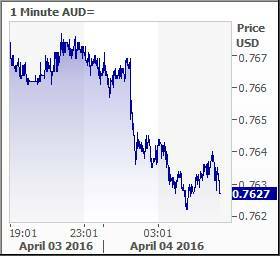 Unfortunately for the RBA chief, the level of the currency seems to be out of his control. Energy stocks were slammed following the falling WTI price, after Saudi Arabia talked tough on Iran having to freeze output. Origin Energy (ORG) -5.51%, Woodside (WPL) -2.69%, Oil Search (OSH) -2.61% and Santos (STO) -4.34%. Seems there will be plenty of trading opportunities between now and the OPEC Doha meeting on April 17. Financials and banks tried really hard to keep the market in very positive territory following an earnings outlook statement from Macquarie Group (MQG) +0.75% first thing this morning. The big four were around 0.5% better with National Bank (NAB) +0.82% the best performer. Insurers were positive QBE Insurance (QBE) +1.22% and Medibank Private (MPL) +0.69% the two performers. Industrials mixed with gaming stocks slipping slightly Aristocrat (ALL) -1.96% and Crown Resorts (CWN) -1.7%. Couple of retailers in the sellers’ sights today, Billabong (BBG) -5.37% and Gazal Corporation (GZL) -7.17%. Information technology was a string sector today. Xero (XRO) +6.43%, Freelancer (FLN) +8.71% and Technology One (TNE) +3.17%. Telstra (TLS) -0.19% shrugged off more bad PR from its free data day. ‘Clean and Green’ stocks were in demand following Bellamy’s chief in the press. 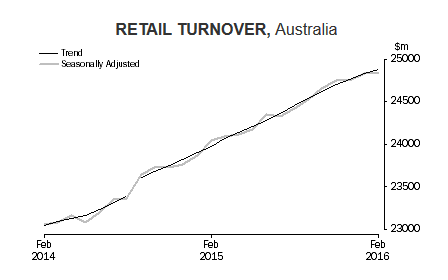 Blackmores (BKL) +4.27%led the charge Blackmores (BKL) +4.27% with BWX +4.67% and Vitaco Holdings (VIT) +2.65. Speculative stock of the day: Argonaut (ARE) +25% following an announcement on its Lake Blanche lithium brine project with exploration licences being granted. Lithium carbonate prices have soared from US$8,000 a tonne in September to US$26,000 in March. Arrium (ARI) is in a trading halt following news that the banks exposed to the huge debt have knocked back plans from US Vulture Fund GSO Capital to inject $1.2bn. The funds would have been used to pay back the banks 55 cents in the dollar. This looks like the final act as the company must now pull a rabbit out of the hat to survive. The Asciano (AIO) -1.23% takeover has taken yet another turn today, with the ACCC now concerned about the commercial arrangement between the partners in the deal. The submission process is due to close April 18 with the final decision in late May. News in the media today from Bellamy’s (BAL) +0.2% CEO Laura McBain that the upcoming tax on overseas internet imports will have little effect on demand. Action today in the gold sector with Diversified Minerals upping its takeover offer for Unity Mining (UML) +11.54% to 2.2c and a capital return of 1c per share. If the deal does not go through then Unity will sell its interest in the Henty Gold mine to Diversified for $7.1m. 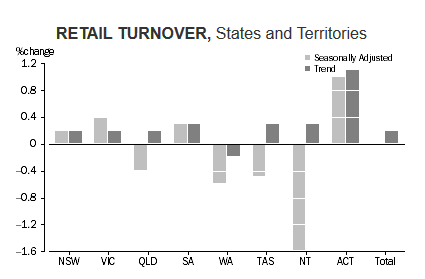 February retail sales were flat, disappointing compared to expectations of a 0.4% rise and those looking for more signs of a consumer-led recovery. 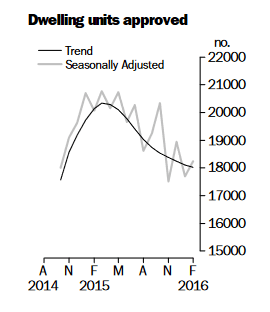 February building approvals rose a solid 3.1%, rebounding from the previous month’s 7.5% decline and eclipsing predictions of a 2.0% rise. 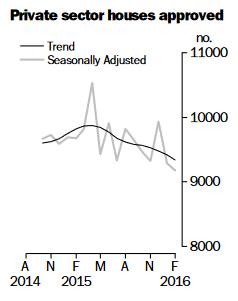 March ANZ job ads rose 0.2%, following February’s 1.2% decline. Seems all is not beer and skittles with relationships between the IMF and the Greeks. Reports in the European media that the IMF is trying to push Greece towards a ‘default’ in an effort to get some movements from the politicians is not being taken well by the Greeks. They have enough issues at the moment as they are the front line on Merkel’s great welcome mat to fleeing refugees from Syria. The bailout review continues though, so expect to hear more on this in coming days.